I originally got the idea for this from something Colin Cowherd said. And it r e a l l y made me think. Michael retired in the middle of his career to go pursue his dream of being an MLB baseball player. It’s no secret the entire world believes Lebron has a real future in the NFL. He LOVES football and misses playing since his days in high school. He’s 6’8″ 265 lbs. That is about the most perfect body a tight end could have. I bet you, football abilities or not, that if Lebron decided to take a year off and pursue a career in the NFL he’d receive a call from all 32 teams within the first 5 minutes of his decision. Cowherd makes some really excellent points. He’s right. Everyone is always worried about the next job right away. They rarely take time to really think about what the best move for them is. The Lakers are too young, Philly would be great on paper but end in disaster, the Warriors would be a sell-out and San Antonio would be a long-shot with the Rockets and Warriors both in the same conference. Lebron has made enough money for 4 lifetimes and he could care less about that. He’s focusing on his brand. 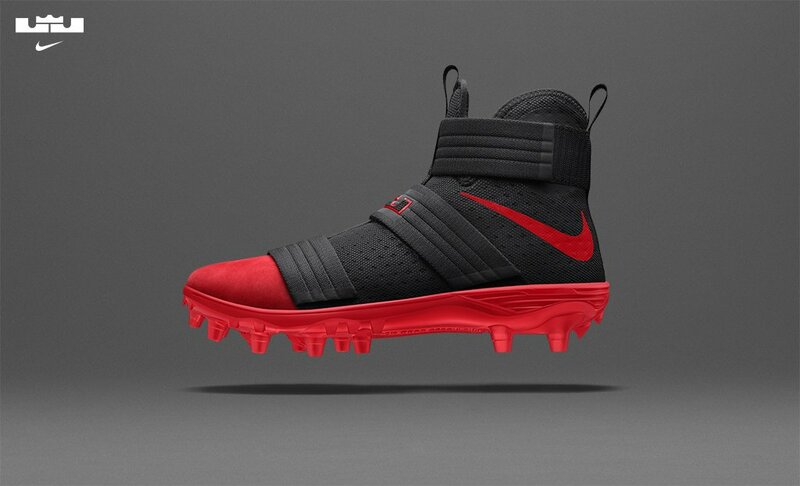 Lebron football cleats? They look pretty sick, remember when Ohio State wore them? One year can make all the difference. Colin said it. Let’s see if the Lakers and Sixers continue to grow, if the Spurs and Kawhi Leonard can continue to build. There are plenty of pieces out there and moves to be made. But, it’s all about timing and right now, is just not the right time for his next move in the NBA. Take his talents to the NFL. Don’t make the wrong move and “damage” his reputation of losing ANOTHER Finals. I put damage in quotations because it’s a bunch of BS and it’s just haters being haters. Seven consecutive NBA Finals appearances? Astounding. Jerry Jones would eat this up. It makes too much sense. Lebron to the NFL is a work of art.